mySewnet™ services cloud allows easy access to embroideries from multiple devices, including your computer, tablet or DESIGNER EPIC™ machine. They will always be synchronized and available whenever you need them via WiFi. The free App - mySewMonitor - provides you with real time updates on the status of your embroidery even when you’re away from your DESIGNER EPIC™. *With the optional DESIGNER™ Majestic Hoop you can create and embroider designs up to 360x350mm without re-hooping. The DESIGNER EPIC™ machine has a 30% larger bobbin than our previous machines, enabling you to do more sewing and embroidering before it’s time to change your bobbin. With the enhanced JoyOS Advisor™ there's 120 step-by-step animated and illustrated tutorials so that sewers of all skill levels will accomplish whatever your heart desires, with ease. The DESIGNER EPIC™ sewing and embroidery machine has smart WiFi functions. The DESIGNER EPIC™ machine is the largest, brightest, yet lightest machine. And it features the most space to work, the best viewing angles, and more for quilting enthusiasts. At HUSQVARNA VIKING® we share your passion for sewing and embroidery. That’s why we thought through every detail – big and small! At HUSQVARNA VIKING® , we’re only a sewing company…Our sole focus is to put the joy of sewing and unlimited creativity into the enthusiast sewer’s hands. You're unique and you like to express your style... but that requires a machine that's up to the task. When embroidering on the new DESIGNER EPIC™ sewing and embroidery machine you will receive instant updates. 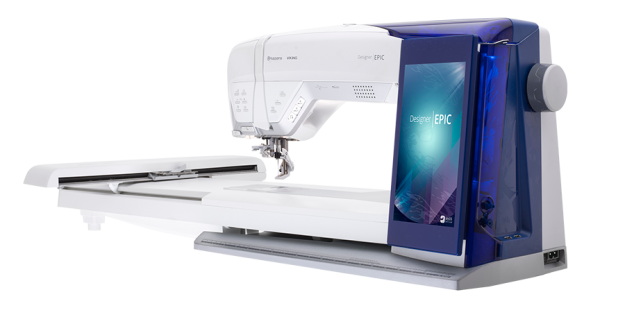 The new HUSQVARNA VIKING® DESIGNER EPIC™ sewing and embroidery machine is the largest yet lightest top-of-the-line machine. Create, store and access your designs from anywhere – with the DESIGNER EPIC™ Sewing & Embroidery machine’s new built-in storage,mySewnet™ cloud. 120 animated, illustrated and step-by-step tutorials built into the machine.